The VOX Showroom - The Vox V303J Continental II Organ - "Under the Hood"
The Vox V303J "English" Continental II Organ - "What's Under the Hood"
Once the orange lid is removed from the top of a V303J Vox Continental, the electronic subsystems that make up the organ are visible. A brief overview of the operation of the Continental II follows, below, with much more detailed information on web pages to follow. Power Supply - It all starts here. 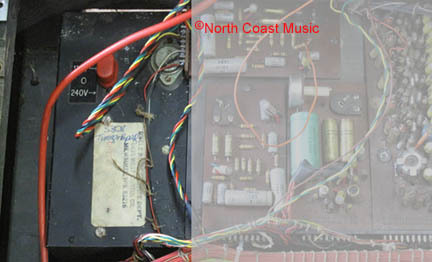 Located in the upper left corner of the picture above, the power supply converts the local AC or Mains voltage (either 120 or 240 volts, selectable by end user) to the DC voltages needed to operated the organ circuits. The power supply sends a negative 8.2 volt DC supply to the tone generators. Tone Generators - Twelve individual tone generator cards generate the pitched sounds of the organ. The generator card furthest to the left in the illustration above produces all the "C" tones, the card furthest to the right produces all the "B" tones. These signals are sent to the key contacts through the distribution wiring harness. 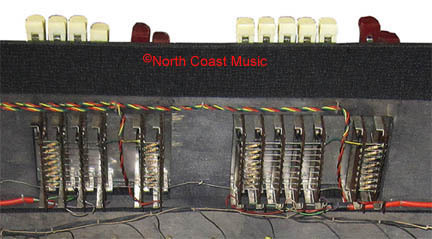 Distribution Wiring Harness - The wires in this harness carry the pitched signals from the tone generators to the switching contacts under each key in the organ. 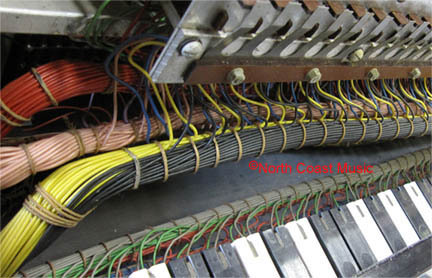 Another cable carries signals from the keys being played to the drawbars. Plastic Keys and Key Contacts - The Continental II has 49 plastic keys in both the upper and lower manuals. Under each plastic key is a "key contact ram." When the key is despressed, downward pressure is exerted in the key contact ram, which in turn completes the key contact connection to the "signal" or "hot" bussbar. The signals from the "signal" bussbar are sent to the drawbars. Drawbars - The drawbars receive the signals from the key contacts through the red cables entering from the left and right side of the image at left. The drawbars allow the musician to adjust the tone of the organ. The signal that leaves the drawbars is sent to the upper and lower preamp circuit cards. 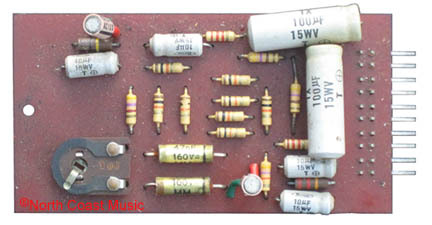 Upper and Lower Preamp Circuit Cards - The upper and lower preamp circuit cards are located adjacent to the power supply. These cards receive the signals from the drawbars and boost the output signal in preparation to be sent to your external amplifier. 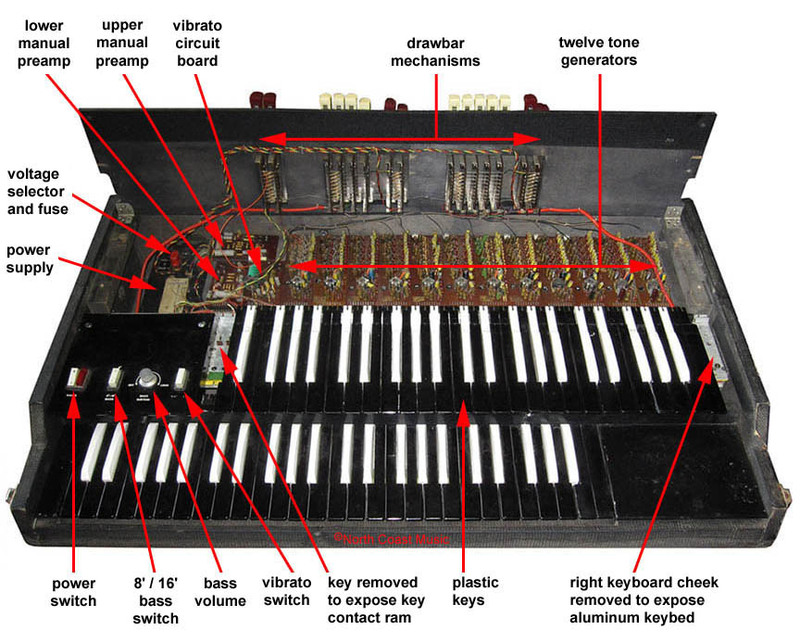 Looking at the picture on the top of the page, the card at the upper left corner of the organ is the upper manual preamp. 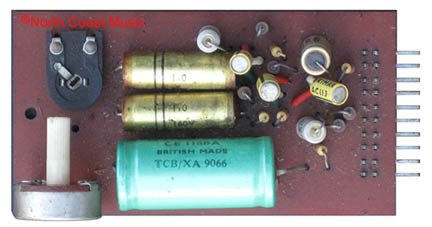 The card at lower left is the lower manual preamp. These cards are interchangeable. Vibrato Circuit Card - The vibrato circuit card lives next to the preamp circuit cards. When engaged by the switch on the left upper manual control panel, it adds the vibrato to both manuals.